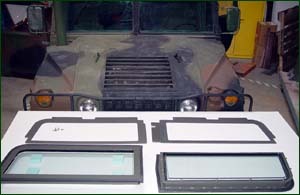 P atriot Armor has developed highly effective armored glass kits for military vehicles. These kits are available in various configurations to defeat threats facing our troops today, including IED fragments and AK-47 rounds. 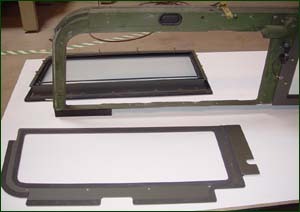 Our M998 HMMWV window kits can be installed quickly without modification to the vehicle. M915 A1 – A5 and M 923 kits are also immediately available. Our team of engineers is eager to address other possible applications or production orders with you. Please call or see our website for more information. Be sure to check our Ballistic Glass Clad specifications. 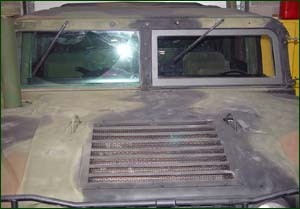 We estimate that at least 30% of the HMMWV casualties are due to projectiles entering the windows. That motivates a simple window armor kit that can dramatically reduce Allied casualties. We have surveyed some of the windshield kits. Our preferred solution is a commercially available windshield kit available from Patriot Armor. The entire Patriot Armor windshield kit is easily installed by two people in thirty minutes and requires no holes be drilled in the HMMWV. There is a maximum of 19.2 square feet of windows. Some HMMWVs such as the two door troop carrier only have two side windows. The unarmored windows will not stop any of the threats considered in Table 3. The steel molding which fastens on the inside (Figure 2), is a High Hardness (500 Brinell) steel which combines with the vehicles structure to resist small arms. It is powder coated and water jet cut. It is bolted from the inside to the exterior molding on the outside with 8 grade 8 bolts per panel. Custom gaskets seal the molding to the HMMWV. The bullet resistant glass is a laminate made up of multiple sheets of Starfire water white glass that are bonded together with urethane. These are compatible with Night Vision Goggles. 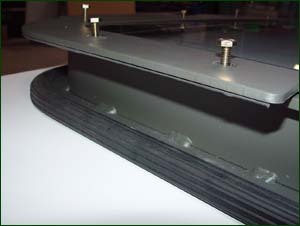 A polycarbonate spall-shield is bonded to the inner surface. Patriot Armor uses an autoclave at an elevated temperature to cure the laminated bullet resistant glass package. The threats in Iraq have changed over the last year. The current biggest threat is now fragments from IEDs (Improvised Explosive Devices). 3.5-inch thick Bullet Resistant Glass is preferred however any Bullet Resistant Glass greater than 2-inches thick will save lives! Two-inch thick bullet resistant glass defeats AK-47 as well as approximately 90% of the fragments from a 152 mm IED. 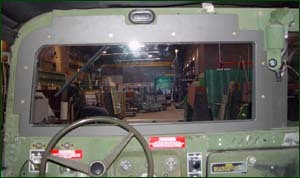 The Patriot Armor Windshield can accommodate glass thickness between 2 to 3.5 inches. The following table is approximate based on our testing as well as recent LLNL results. Our side window kits are approximately one foot on a side and fit inside our armored side door panels. We believe an optimum thickness is 3.5-inches for the side windows.